At several locations in Maple Ridge and Pitt Meadows some new pavement markings called "elephant feet" have appeared in recent years. I suspect that few people know what they mean. The markings are confusing, and so is the name. Sometimes they're called "crossbike crossings", which makes their purpose somewhat clearer. 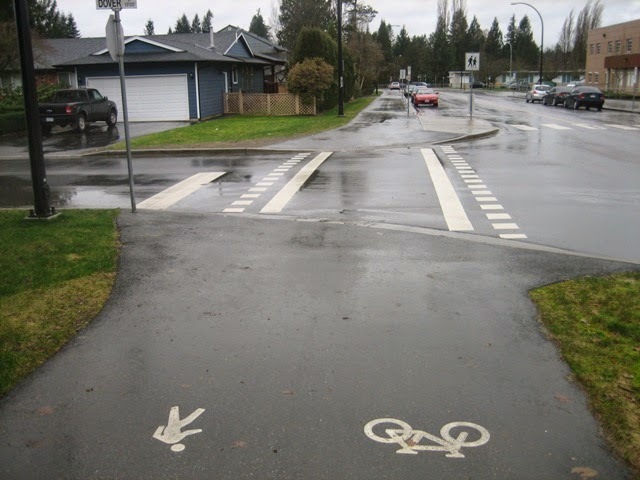 Normally, when cyclists ride on an off-road multi-use path, or a sidewalk - as is allowed in Maple Ridge according to the City's website - cyclists are required to dismount when crossing at a pedestrian crossing. When the crossing has elephant feet markings, they don't need to. The markings can be placed either on each side of a pedestrian crossing - in which case the crossing is shared with pedestrians - or on one side of it - so that pedestrians and cyclists each have their own crossing. In Maple Ridge, shared pedestrian/cyclist crossings can be found along 122nd Ave. and Mountainview Crescent (at Maple Ridge Secondary School), along Abernathy Way between 224th and 232nd Streets, and you'll see them in Pitt Meadows when crossing Kennedy Road near Ferry Slip Road close to the Pitt River Bridge. 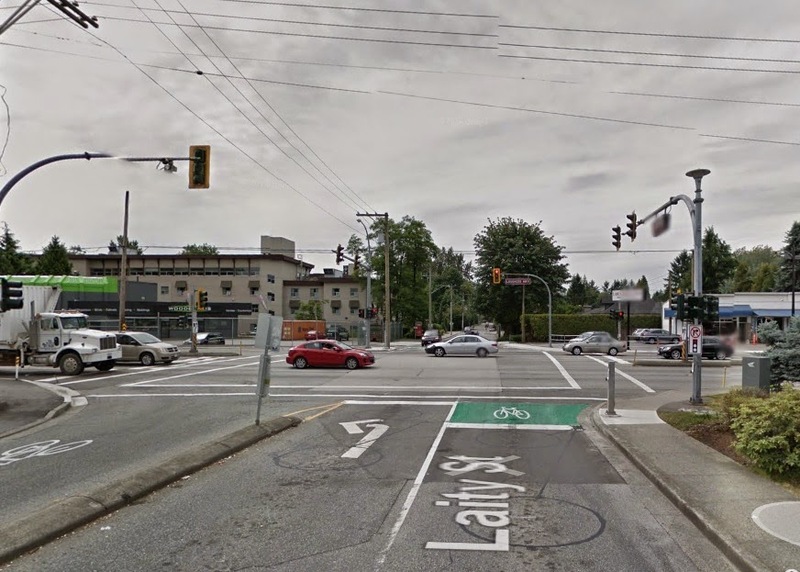 The one in Pitt Meadows is painted green which helps provide clarity that this is a cyclist crossing. Elephant feet are used for the convenience of cyclists. Having to get off your bike at every intersection is very inconvenient and discourages people from biking. Imagine having to get out of your car at every intersection and having to push it across! All road users need to be aware of safety issues with these types of crossings. Most car/bike collisions occur at intersections, and the danger increases when cyclists do not bike on the road. Drivers don't expect cyclists to enter an intersection from a sidewalk or off-road path. Often drivers also under-estimate the speed of a cyclist. Both drivers and cyclists need to slow down, and look out for other traffic nearing the intersection and potentially crossing their path, whether going straight or turning. All the elephant crossings in Maple Ridge and Pitt Meadows are along bi-directional multi-use paths, which means that drivers need to be extra cautious and look out for cyclists coming from both directions. Of course the same goes for drivers entering or exiting driveways that cross a multi-use path. Maple Ridge also has its first "bike boxes", on Laity at the Lougheed intersection. A bike box is a painted green space on the road with a white bicycle symbol inside it. They allow cyclists to position themselves ahead of cars at an intersection. They are meant to reduce collisions between right-turning cars and cyclists going straight, and it also makes it easier for cyclists to make left turns. They also increase visibility of cyclists. What I like about them too is that you don't have to wait behind a car, breathing in its exhaust fumes. Motorists should of course stop behind the bike box. It's safest for cyclists going south on Laity to continue riding in the middle of the lane once past the intersection until they pass the narrowest section of roadway, so they don't get squeezed against the curb when a car passes too close. Drivers, please be aware that cyclists riding in the middle of the lane most often do so to stay safe, so your patience and courtesy would be much appreciated. Please help cyclists get home safe and sound!